Many retailers are wasting precious marketing dollars by continuing to take a traditional approach to their promotional strategies. 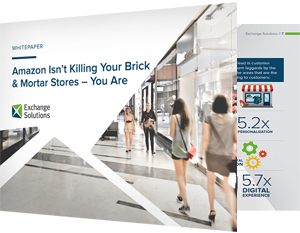 Download this new e-book, from Exchange Solutions and RIS News, to discover how a truly individualized approach to promotions can incentivize shoppers to perform valuable new behaviors, while optimizing marketing spend. 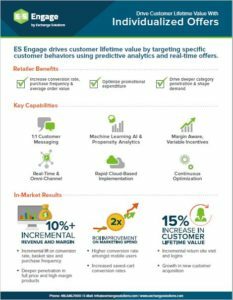 This case study demonstrates how ES Engage, our cloud-based, individualized offers customer engagement product, helped our client to improve conversion rates, average order value, and return on marketing spend. 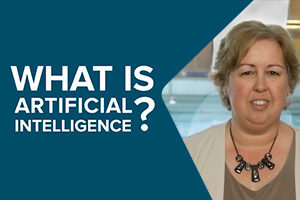 While Machine Learning and Artificial Intelligence are used interchangeably and are usually referenced in dystopian fiction, we do a deeper dive into the branch of AI that has actual applications in E-Commerce. This whitepaper shares how Narrow Artificial Intelligence puts smarter selling and shopping within reach. As shoppers, we’re starting to find that websites seem to be getting smarter. 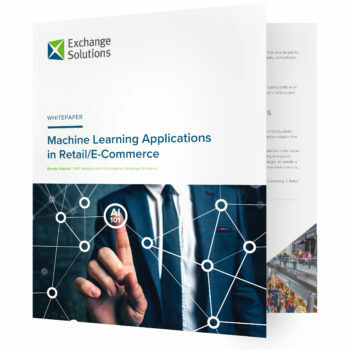 This whitepaper shares how machines are making our online shopping experiences better for us as shoppers and for retailers as sellers. As we’ve evolved our ability to learn more and more about our customers, loyalty programs have also changed to become even more effective in keeping the attention focused on individual brands with real-time technology, advanced analytics and compelling customer experiences. Are you positioned to take full advantage of the fast evolving loyalty program potential? As e-commerce continues to grow at a rapid pace, there is heightened focus on the customer shopping experience which presents valuable opportunities to improve e-commerce site performance – in turn, improving customer lifetime value and engagement. This whitepaper will give you five techniques to modifying a customer’s in-session shopping behavior. There’s been a lot of talk about the evolution of loyalty. Here are 10 key questions you might be asking about the new types of innovative loyalty programs and answers to help you navigate the hype. What Type of Customer Engagement Program is Right for Your Company? Proprietary and Coalition customer loyalty programs both have their advantages. This whitepaper will examine three key areas that organizations should consider when deciding which type of program is right for them. 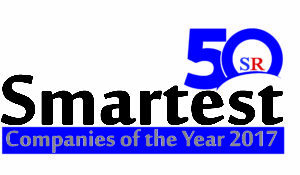 We are thrilled to be named one of the 50 Smartest Companies of 2017 by The Silicon Review! Read about how our unique platforms uniquely and deeply meet the needs of our customers and drive customer lifetime value while reducing promotional spend. 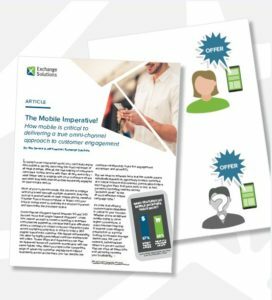 In this article, we discuss how mobile is critical to delivering a true omni-channel approach to customer engagement. After all, the vast majority of consumers carry their mobile device with them all day, every day – what better way to reach known and unknown customers at a critical moment with relevant, personalized offers? Exchange Solutions’ unique use of analytics has earned us a spot in Retail CIO Outlook’s TOP 10 Analytics Solution Providers 2017. Check out our cover feature and learn about our innovative customer engagement and loyalty programs that help retail and e-commerce businesses increase valuable customer behaviors in order to drive incremental sales and margin while reducing marketing spend. Grocery is the final frontier for the true omnichannel dynamic, and today grocery shopping online is still more hypothetical than a true business driver. Although traditional in-store behaviors are still prevalent, like most businesses, grocery will somehow, someday find its way more prominently online. Retail marketers will need to be at the forefront with the right strategies in place to capitalize on this shift. Being a softlines retail marketer isn’t easy. Knowing your customers’ needs is simple; the hard part is connecting them with the right merchandise, at the right time with the right offer. The speed of marketing execution needs to be as fast as your customer’s fleeting interests, and merchandise targeting needs to be as precise as their wants and your inventory. Advanced customer engagement has dramatically improved in step with advances in cloud-based computing, machine learning analytics and real-time customer experience. With that in mind, this article presents three ways to improve share of wallet by driving more effective customer engagement. Average order value (AOV) has always been a chief key performance indicator for online retailers. Marketers are constantly looking for the right balance between increasing a customer’s AOV while minimizing the impact of temporarily pulling sales forward and over-spending on promotion. The ultimate goal is to obtain the best of both worlds: having your customers increase their average order value during each visit while lowering promotional costs. This article will help you identify the right marketing investment to get there. Most companies are already taking advantage of customer data to make personalized marketing a reality, but it’s important to note the clear distinction between personalized messages and individualized marketing. Fueled by robust data insights, individualized marketing delivers targeted offers based on individual behaviors, character traits and profiles, and is one of the most vital drivers of customer loyalty and profitability. To start individualizing your marketing, here are three tips to becoming a world-class, one-to-one marketer. and it all starts with understanding your customers and what motivates them. Grocery retailing is a dynamic and highly competitive industry, and is becoming even more so. Consumers have more shopping choices than ever, and protecting and building loyalty is no easy feat. Retail leaders are looking for a heightened understanding of shoppers’ mindsets and how to use data to better understand what drives their customers’ shopping decisions. With the right tools in place, you can make smarter and more profitable marketing decisions, and it all starts with rewarding your customers for the right behaviors. The customer loyalty landscape is changing rapidly, and that pace of change is likely to accelerate in 2016. More and more, companies are viewing their loyalty investments as an opportunity to differentiate themselves and drive positive ROI for the business. Three of the key trends driving this change in mindset are: personalization, the omni-channel customer experience and connected devices. Designing or Upgrading Your Loyalty Program: Should You Build, Buy or Partner? When it comes to designing or upgrading a proprietary customer loyalty program, there are three options available: building the program internally, buying a subscription to a SaaS loyalty platform, or partnering with a managed services provider for a customized program. Each has its unique advantages and disadvantages, and the “right” fit will depend on your business objectives and the resources you have available. The Exchange Solutions optimization team are currently working with the technology team to create the “third generation” of the core customer engagement platform using the most cutting edge, rigorous, adaptive algorithms available today. The new and improved optimization techniques will not only create a positive impact for Exchange Solutions’ clients and clients’ customers, but will have a bar-raising effect on the customer engagement industry at large. As shoppers become increasingly tech savvy, access to more knowledge and options is breaking down the barrier to switching brands. As a result, more and more companies are starting rewards programs to engage and retain their customers. If you’re considering starting a rewards program or enhancing an existing one, start by understanding how an individualized, data-driven approach, like intelligent customer engagement, as opposed to the traditional approach to loyalty, can drive the most value for your business. In the beginning, loyalty programs were pretty simple – a customer buys something, that customer earns points; that customer burns those points to get something. But this simple “earn and burn” type loyalty program rewards everyone equally for their business. The new generation of customer engagement programs allow companies to treat customers on a one-to-one basis, thus driving ROI on their loyalty investment. Learn more about how ES Engage drives customer lifetime value for top enterprise retailers. Watch now. 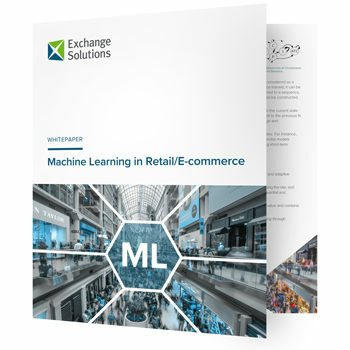 This video featuring our SVP, Analytics and Optimization, Brenda Higuchi, explains how Exchange Solutions uses Machine Learning analytics to drive Customer Lifetime Value for top retailers. Watch now. 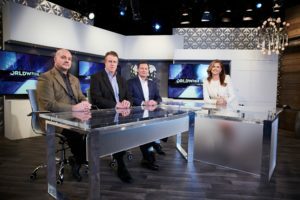 Award-winning global TV show Worldwide Business with kathy ireland® interviews Exchange Solutions about how retail businesses can retain and engage customers for life. Watch now. Learn more about how ES Engage drives customer lifetime value using individualized offers. Download.